For the Dutch wine maker and taster Ilja Gort, the most precious part of his body is his nose! A Lloyd’s of London syndicate said Tuesday it is insuring the nose of winemaker Ilja Gort for $8 million. He took out the policy after hearing about a man who lost his sense of smell in a car accident. The news scared Ilja. What would happen if he lost his? The custom policy covers Gort for the loss of either his nose or his sense of smell and has some conditions for protecting his nose. They also took note of Gort’s long, curly beard in drafting the policy. What could those conditions be? Among other things, he is barred from riding a motorcycle or working as a knife thrower’s assistant or fire-breather. And what has the “long, curly beard” got to do with his nose and smell? A clause requires that the winemaker use only experienced barbers who will keep their razors steady near his nose. Baba Amte’s brave and compassionate life bears the marks of greatness without any myths enveloping it. It’s when I tried to know about this great man that I understood the meaning of ‘naked truth’. During the six decade long hard work he put into the making of Anandwan (Forest of Joy), providing “meaningful rehabilitation” to India’s leprosy patients and other outcasts, he never allowed any myth or label build around him or his work. That’s no mean achievement in a country where gurus and yogis of all sorts abound; where common people are easily hoodwinked by peddlers on god preaching and publicizing the scope of their charity work. Like Buddha, Baba Amte renounced all luxuries and privileges that were rightfully his by birth. But Amte’s goal was not enlightenment. He took his young wife and two little sons along with him and went in search of lepers and others rejected by ‘healthy society’ from its fold. He found them a place to live in, treated and nursed them, taught them productive skills and thereby restored their ‘self-respect’ and ‘self-worth’. He showed the world how to build man out of his very ruin! 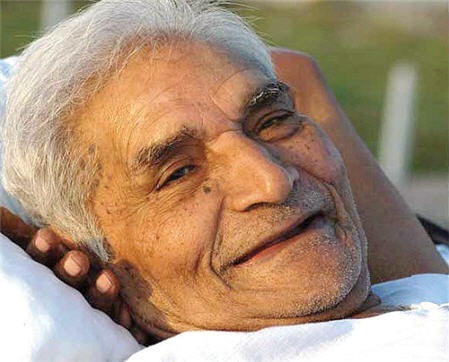 Yes, “to be used” – When Baba Amte died on 9 Feb 2008, at the ripe age of 93 years, he was buried as per his wish so that his body could become one with “mother earth” and be useful for plants. Links: 1. For information on Anandwan and satellite projects click here. 2. For a biography of Baba Amte click here. 3. For another one click here. 4. For a short film on Baba and Anandwan click here. 5. Economist has an article on Baba Amte here.